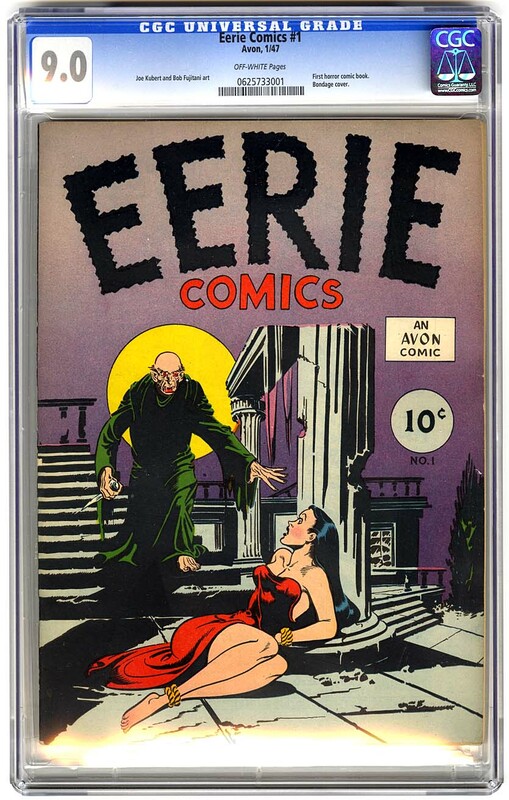 In honor of the scariest month of the year, I decided that all month long, I'll be talking about nothing but horror comics, and to start it all off, I'll go all the way to the beginning with Eerie Comics #1. To be completely honest, this isn't the first horror comic ever made, but it is the first comic that has original stories written for it. 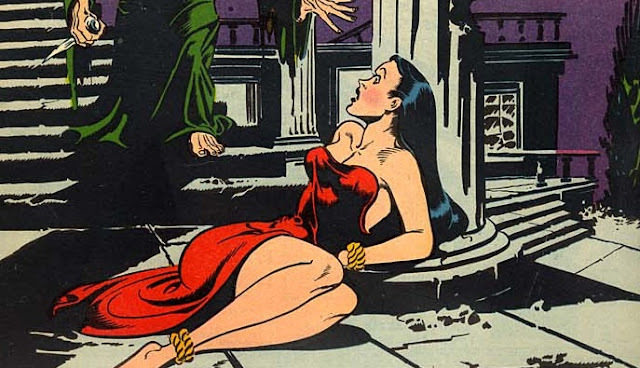 Before this comic came out, horror comics were adaptations of stories that were already popular, like Frankenstein or Dr. Jekyll and Mr. Hyde. This issue of Eerie Comics was a one shot deal. It wouldn't be visited again until years later in 1951. Why did it take so long for? Perhaps it wasn't very popular at the time. This was the beginning of horror comics, so maybe it wasn't a big seller. Horror comics really seemed to take off in the early 50's, so it could have been a wait and see mentality from the folks over at Avon Comics. Perhaps they got a lot of complaints from the parents of the kids that read it and they decided to stop producing this title. These are just a couple of theories of mine. I have no idea what the real reason is behind there only being one issue. 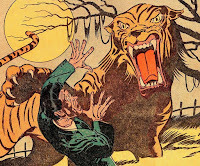 One of my favorite about writing this blog is being able to read all of the wonderful historic comics. It wasn't easy to find a copy of this comic, but I did. The stories in them aren't as graphic or horrific as the horror comics that would be put out by EC Comics in the 50's. In fact, it's rather tame in its depiction. Eerie Comic #1 is a 52 page anthology comic, meaning that it is comprised of many short stories, and not one long one. It's interesting to me that the picture on the cover has nothing to do with any of the stories within it. I was hoping to learn the story behind it, but alas, there was no story to be had. 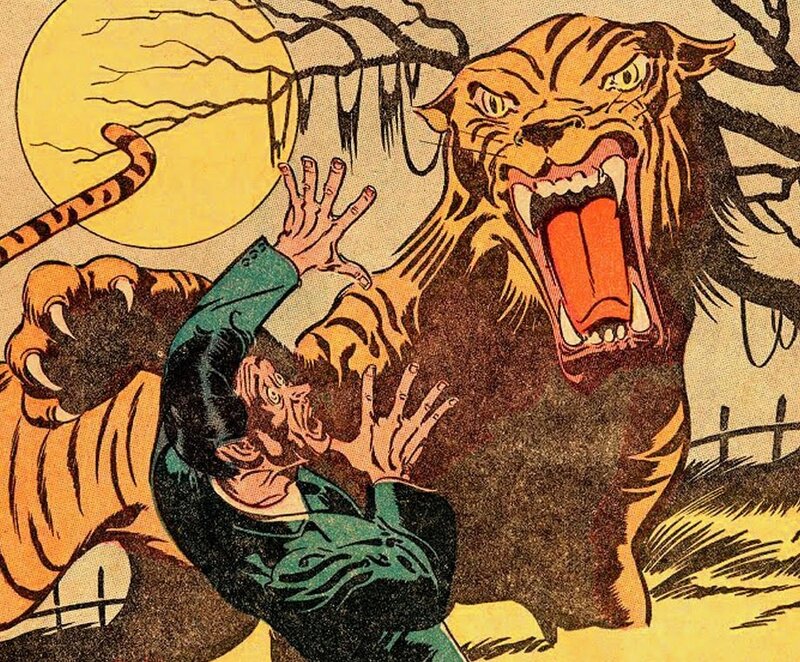 Instead there are stories about a vengeful ghost of a tiger, a haunted mansion, and a short story about an attorney that learns a valuable lesson in perception. In all there are six stories, including a fun two pager staring Goofy Ghost. My favorite part about this story, is that it was supposed to be continued in the next issue of Eerie Comics, but that issue never came saw the light of day. Again, because of the age of this comic, don't expect there the be a lot of graded copies available on the market. As of now, there have been 71 copies graded by CGC. I don't expect that number to change very much in the near future. 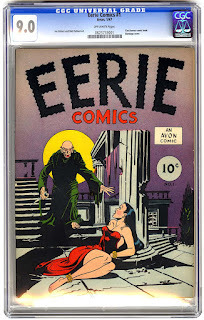 I expect that a lot of copies of Eerie Comics #1 made it's way to a landfill or into a fireplace at some point. Of the copies that are listed in the census, none are graded higher than a 9.2 MN-. Most of the graded copies are in the 4.0 VG to 6.0 F range. Don't expect to find many high grade copies out there. If you're lucky enough to find a copy on the market, you might want to call your bank and get a loan. These comics are not cheap, even in lower grades. There isn't a lot of sales data out there for this book, but the numbers that are available, are quite high. I'll start off with an 8.5 VF+ copy since there are some good data points for it. In 2009 a copy at that grade sold for $3,107 at Heritage Auctions. That last sale at the same site and at the same grade sold for over $9,500. That really is quite amazing. However, lower grades aren't seeing this kind of growth. A 5.0 F- copy sold for $1,191 in 2012 and went up to only $1,250 in Feb of 2016. As we go down to a 4.0 VG copy, there was a sale in 2011 that dropped for $711 and then rose up to $775.25 about a year later. If you're looking for the best investment potential, the higher grade the better. Rarity will play a huge factor in the value of this comic. It's almost impossible to find any copies online, graded or raw. I can usually find one or two copies of hard to find comics at one of the big online auction sites like eBay, but as of this writing, I couldn't find any. I'll leave the links at the bottom of the page like normal because you never know when a copy will be listed. My advice for you is to check back often, and if you find a copy for sale, buy it.